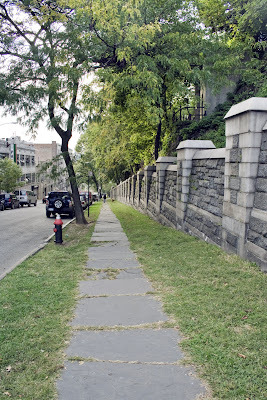 In my determination to find an entrance to the cemetery, I abandoned my plan of walking straight down Broadway to 145th Street. Now I'm walking west down to the river. 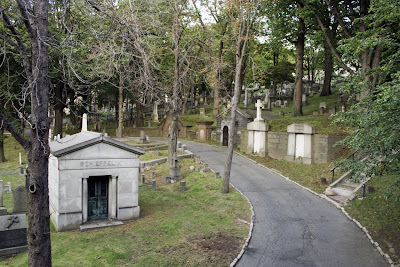 I'll walk around the whole cemetery, if necessary. 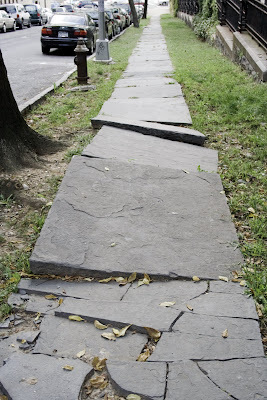 Don't you love this sidewalk? It's so uncitylike. And here a nice demonstration of the power of nature. Wouldn't you have liked to have been here when it first cracked? Here's another chained gate, this time with a sign telling me I may not enter without permission. So that's it. There are important people buried in here after all. Well, they can't stop me from taking photographs. You should try to take a walk back to the cemetary when you have the time. 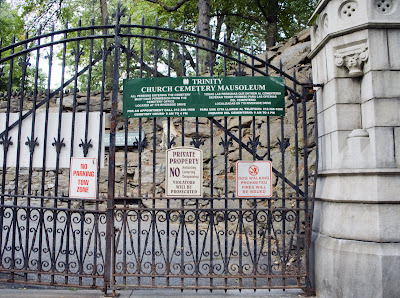 Many famous people buried their including the son of Charles Dickens (not kidding). He died during a visit to New York and was buried there.